The vocalists function like the choir: they are musicians who have been set apart for rehearsing for worship and helping to lead the congregation in its role of prayer, praise, and thanksgiving to God. They are responsible for supporting congregational song, embellishing congregational song (harmonies, descants), and singing other liturgically and thematically appropriate music that would be outside the ability of the congregation as a whole. However, like the choir/organ, this new ensemble can also be guilty of sins against the congregation’s music. 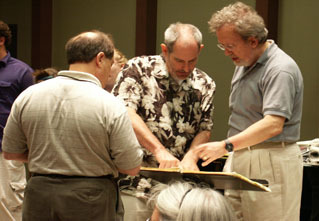 It can rehearse large, virtuosic works that overshadow or supplant the congregation’s singing; it can lead too loudly, too poorly, or in any number of other ways that silence the congregation; and it can easily think of itself as primarily a performance ensemble rather than primarily worship leadership and support. When was the last time you heard a praise band do a “large, virtuosic” work? I’ll give you virtuosic, in terms of individual solos within the band context, and even when a really good band has rehearsed something that is the worship equivalent to Phil Spector’s wall of sound, or the Eagles’ ability to write a good hook…but large? Long, maybe, as in, “let’s repeat the chorus because it feels so good (or so that I can start to layer licks over the top like Layla)”…but large? Perhaps your experience is different. Please leave a comment and let me know what you think: is your band a group of individuals, or an ensemble? Is your choir sensitive if you tell them they sing too loud? Does your band do large, virtuosic works? Do you understand how a musical group can be “guilty of sins AGAINST (my emphasis) a congregation’s music”? Any other thoughts?